Got an acoustic guitar with a built-in pickup? Wondering why it sounds awful when you plug it in? You know, unwanted noise, feedback, distortion? The most likely culprit is your guitars built-in, factory installed preamp. What you need is an external acoustic guitar preamp. The preamps you find built into acoustic guitars are often overly simplistic. They sometimes have a few EQ controls, but mostly lack the additional functions you find on the products we feature here. So what do they give you that your built-in one doesn’t? Well, greater control over your EQ for a start, a much better boost of your signal and removal of any unwanted frequencies. Some can even add effects. In this article, we’re going to guide you through how to pick the right one. Finally, we’ll recommend some of our favorites on the market. If you want a glance at the products, here you go. This is what we’re going to cover in this article. What is an Acoustic Guitar Preamp? What Type of Pickup You Have? It’s a device, similar in looks to an effects pedal, that boosts low-level signals, resulting in better quality audio. They often have a feature to cut out unwanted frequencies which gives you a cleaner tone too. They also double up as DI boxes – a DI box is essential when you’re performing live as it transforms the high impedance signal into a low impedance signal, allowing you to use longer leads – i.e., from the stage to the mixing desk – without interference. They come in two formats: foot pedals, or as small, hand-controlled devices. We’ve already touched on the benefits, but let’s elaborate a bit more. Boosting low signals is often the primary reason people turn to preamps. If the signal from your guitar is low, it’s going to get distorted as soon as you try giving it any volume. A pre-amp gives you the option to increase the volume of your signal so that it travels to the amp at a decent level. Sometimes, you might want to play around with the tone controls on your guitar. Preamps allow you to adjust the signal that’s coming through (i.e., your EQ). Need a bit more bass? Whack up the lows. Too tinny? Turn the highs down. You get the picture. EQ controls are normally three bands: hi, mid and bass. However, some pedals offer extra controllability by having five options. This enables you to really fine tune things. Some pedals don’t have five band EQ, but they do have a mid-range shifter, which means you can adjust the frequencies that your controls are directing. Acoustic guitars are prone to getting feedback. Pre-amps include filter controls (called ‘notch’ filters) which eliminate excess noise from your signal by the narrowing the band of frequencies that are causing feedback. Once you get rid of these unwanted noises, your guitar will be closer to being like its unplugged self. A lot of these pedals offer feedback suppression via a footswitch. This is easier and more convenient than a notched knob, as you can do it mid-performance without crouching to the floor. Another useful benefit is for blending signals. You might want to use a pickup and a microphone on your guitar, and these will need to be in sync. A preamp combines these two signals and creates one output to send to your amplifier. When you gig, your signal is controlled by a sound engineer who probably isn’t familiar with you or your style. Considering all the variables at play, how could they possibly know what’s right for you? Carrying a small device which allows you to set your EQ, reduces feedback and also boosts your signal is the key to being your best when you step on stage. Many preamps include a ‘phase’ button. If there are no problems, then the effects of using this button may be inaudible. However, if you’re inexplicably out of time, try clicking it. It reverses the signals, which sometimes needs doing to put things in place. Ok, you know the benefits. What are the things to look out for when buying one of these gizmos? Let’s take a look. There is a lot of confusion about the difference between passive and active pickups. If your guitar has a built-in pickup, it’s likely that it’s an active pickup – these pickups tend to include a preamp already but as we mentioned earlier, they’re often inadequate. The addition of an external preamp will increase your tonal options and reduce any unwanted noises or frequencies. Look out for something with five-band EQ, to increase your tonal control. If you have a passive pickup – the kind you attach yourself – the signal it produces will be lower than you’d require for a quality tone. You’ll need a preamp to boost this, and to reduce any feedback that it may cause. Magnetic pickups are very similar to those used in electric guitars. The more EQ and frequency settings you have here, the more you’ll be able to edit your sound until its as you think it should be. Mixing desks, with XLR inputs, are what we plug into at gigs. In situations like these, a preamp will act like a DI box, to change the high impedance signal from your guitar into a low impedance signal, and to convert the connection to an XLR which can go into a desk. When you’re plugged in, you can then use it to shape your tone in a way that the mixing desk alone cannot do as effectively, as it’s designed with a broader range of instruments in mind. Even so, many guitarists still choose to use an additional preamp, for a higher level of controllability. Also, if you’re using a passive/piezo pickup, you’ll still require the signal boost of a preamp before you send your sound towards the amp. So, now you know what to look for, let’s have a look at some of the best ones out there. We’ve taken a look at the most popular ones. This is a professional level preamp which combines preamp, EQ and DI box functionalities. It also has a chromatic tuner for your convenience, phase inversion to ensure everything is in sync and a feedback suppressor to give you a clean sound. One of the best features of this pedal is its LED meters, which allow you to keep an eye on your levels easily when you’re on stage. Contains all of the features you need, including 5 band EQ settings, phase inversion, and a feedback suppressor. The volume boost switch allows you to easily bring out choruses or take the lead role in solos. Can be either battery or DC powered. The tuner shuts off automatically after too much time has passed, which can make it irritating to keep cycling back through if you get distracted. 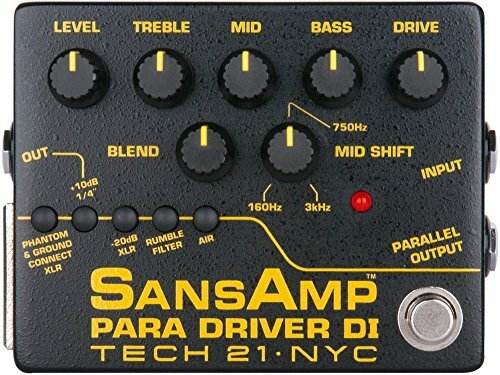 It’s an expensive piece of gear, but due to the combination of functions it has, it’s cheaper than buying multiple mid-range pedals that only do one thing each. This pedal has 3 band EQ, and a processor button to clean up your signal, ready for further amplification. It features a ‘sonic maximizer’, which automatically adds clarity and definition to your instrument, and a phase reverser which can fix any out-of-sync sounds. This is a sturdy and reliable pedal that’s easy to control. Tightens up the frequencies easily and accurately due to its extensive selection of controls. 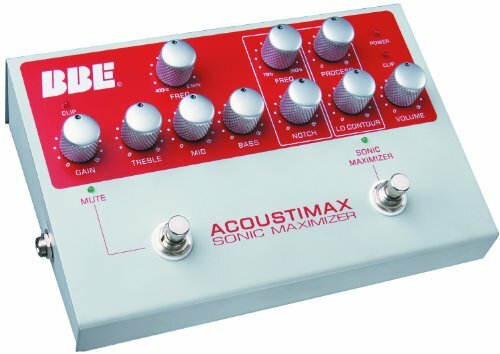 The ‘sonic maximizer’ feature produces a boosted, clear preset at the switch of a button. This pedal has not only EQ knobs, but also a large amount of modelling capabilities that allow you to transform your sound completely. 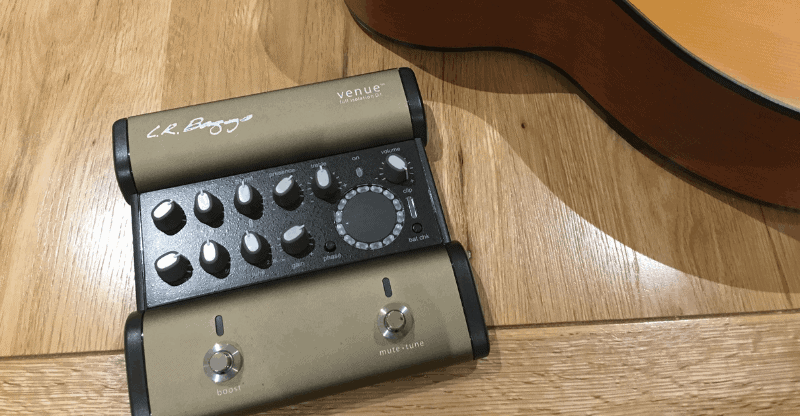 There are presets for 12 string guitar, and everything from orchestra to bluegrass, so it’s the perfect acoustic preamp for those people who play guitars which aren’t standard six string acoustics. There’s a tuner built in for your convenience, a built-in compressor to further tidy up your signal, and an anti-feedback button to save your speakers and your ears. Incorporates the Aura Acoustic Imaging technology that allows recreation of the tonal qualities of various acoustic guitars and other instruments. Includes a chromatic tuner and compressor, as well as EQ controls. Easy to control/eliminate feedback with one push of a button. Using the Aura imaging can take a lot of tweaking to get a good tone. In a live situation, this might not be ideal. Some of the components are a little fragile. The Tech 21 is perfect for those who are playing through passive pickups. It actively balances out some of the weaknesses of piezo pickups to give a warmer and more natural sound. This is a versatile product, which combines three-band EQ with a mid-shift control for extra equalization options. There’s also an overdrive effect, should you want a bit of an edge or full on dirtiness. As well as working for acoustic guitars, you can use this for your electric guitars or bass guitars, making it a more versatile piece of kit. Can boost and cut 12db with dedicated buttons for quickly switching between lead and rhythm. Can also be used with solid-body instruments, making it potentially more useful and versatile. There’s a full range of tone shaping knobs including a mid shift control, so you can set your mid-range for extra controllability. Adds quite a lot of color to your tone, which won’t suit those who are aiming for the most natural tones. The Radial Tonebone is an extremely popular unit among many well-known guitarists. It’s purpose-built for use with acoustic guitars and has a lot of functionality for a single piece of equipment. There are pre and post-EQ outputs and an effects loop send and return, which makes it ideal for combining with other pedals. There’s also a boost option, a notch knob for feedback control and three-foot controls for boost, toggle and mute. Very transparent, it allows your guitar’s natural harmonics to come through while tweaking it slightly through the EQ settings, filters, and additional DI features. 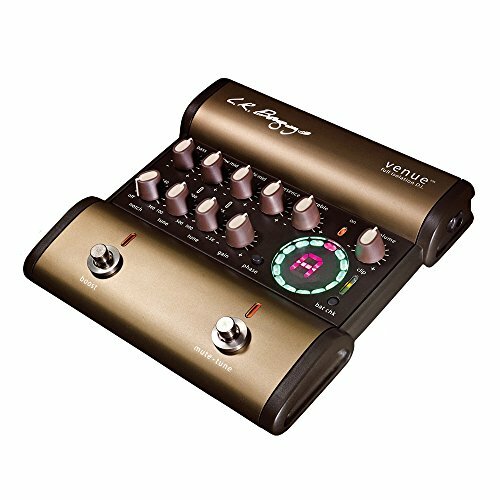 Has two channels for making the most out of your pickups or a pickup plus a mic, although it’s not designed for use with multiple instruments at once. Comes at a very high price, making it one of the most expensive on our list. It has a 15v power supply, which is nonstandard in guitar pedals. Are you looking for something with a lot of features packed in or something with the largest amount of EQ controllability? Do you need a battery power option and a small pedal, or are you after something sturdy and substantial, that you’re happy to plug into the mains? Our top pick is the LR Baggs Venue DI. Its impressive amount of features enabled us to significantly reduce the number of various pieces of equipment we were carrying back and forth to every gig, and the quality of the tone shaping options was excellent. 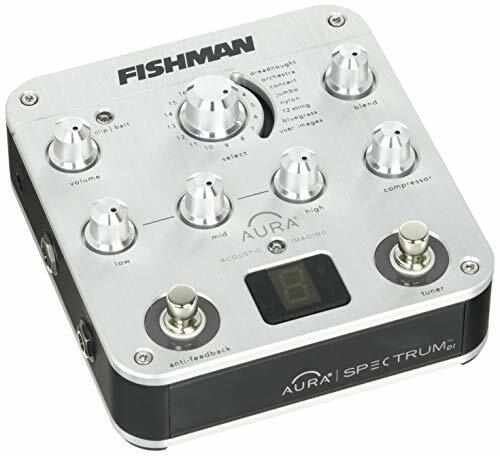 However, if you like to get a little more variety in the kind of sound you produce, rather than just tightening up the frequencies here and there, the Fishman Aura Spectrum DI gives the most versatility. It’s well worth trying out, just beware that many of the different ‘images’ have novelty value and it’s unlikely you’ll use them all. You might want to consider the value for money in terms of which features you actually use. If cost is an issue, it might be worth checking out the BBE Acoustimax if keeping the total cost as low as possible is your main priority. It does what it does well, but it’s not an all in one box like the LR Baggs Venue or the Radial Tonebone PZ. The cost may seem cheaper, but you’re getting less functionality. As a final note, some preamps are designed with multiple instruments in mind. 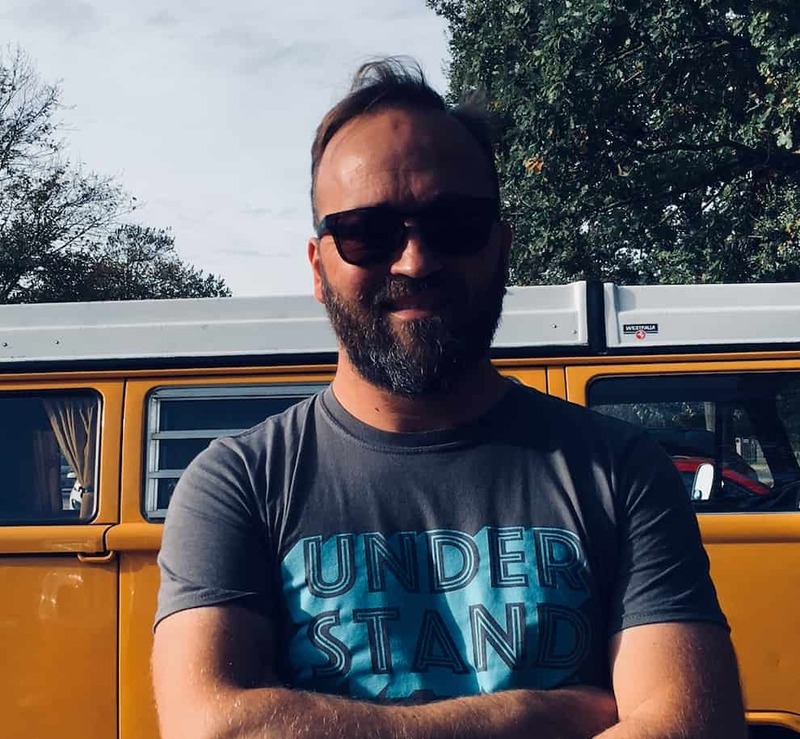 This usually isn’t a problem, and may indeed be a benefit to you, but some of the subtler nuances of acoustic amplification are lost in a preamp that isn’t purpose-designed. 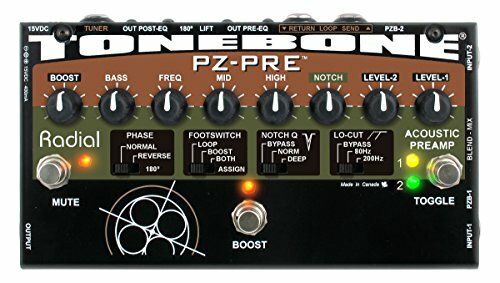 If you want to be certain that you’ll get the right tone shaping properties for your acoustic guitar, the Radial Tonebone PZ – designed with acoustic guitars in mind – gives you the finest tuning control. As well as having multiple EQ controls, a feedback suppressor and boost options, this pedal has numerous inputs and outputs, which can massively increase your fine-tuning options. Finally, the Tech 21 is perfect for those who need to boost a weak sounding piezo pickup, as it eliminates the unwanted harmonics which can sometimes be associated with piezos. Whichever one you choose, we hope that you enjoy the newfound controllability and peace of mind that that brings.